We are among the pioneers in the industry for manufacturing and supplying Automatic Vial and Bottle Labeling Machine. The offered machine is extensively demanded in a wide range of industries including pharmaceutical, food processing and cosmetics. It ensures operations under hygienic parameters and increases the productivity of work as well. Label Roll Diameter: 300 mm Max. 300 mm Max. 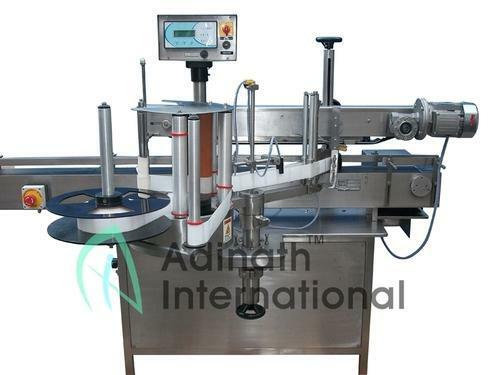 Adinath International, founded in 2009, is an ISO 9001:2008 certified company and is engaged in manufacturing, supplying and exporting a wide range of Pharmaceutical Machinery. Our product range comprises of Ampoule Filling Machines, Vial Liquid Filling Machines and Vial Powder Filling Machines. These machines are regarded for being resistant to corrosion, energy efficient, non-abrasive and user-friendly. These are extensively demanded in pharmaceutical, cosmetics and food processing industries. We exports our products to all over the world. We have constructed a massive infrastructural unit for streamlining our work. Our raw materials are procured from a reliable vendor base for maintaining the industry set standards. We have a huge production unit loaded with innovative technology based machines for offering an impeccable range of products to our customers. Our quality control facility is well-equipped and engaged in checking the quality of the processed goods. We have a reputed clientele based across the globe and we believe in maintaining it for a longer period of time.